Automatic Protection Switching (APS) is a prominent requirement of every service provider's optical infrastructure because it protects users from network outages and is the basis for delivering and satisfying Service Level Agreements (SLAs). Polatis simplifies and reduces APS switch times by localizing fault detection and switching at the physical/fiber layer. As an alternative, higher-level protocols can also command a Polatis switch to reconfigure in the event of non-fiber faults, or turn off automatic protection for maintenance operations. 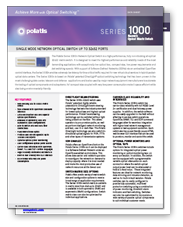 By operating at the physical layer, Polatis delivers faster switching times and a simple, straightforward implementation that can ease the transition between SONET and Ethernet-based schemes. And unlike SONET and Ethernet schemes, it can use dark fiber within the protection pool, thereby optimizing protection bandwidth and reducing overall system costs. There are proven solutions available in implementing wavelength protection. These solutions typically introduce a duplicate of the working signal into a designated protection path and then a verification of working/protect signals is performed at the end point. While this solution is readily available its implementation has not been optimized. 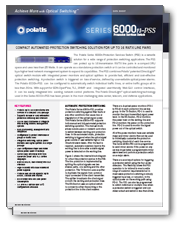 The Polatis 6000n-PSS offers an industry leading 16 Protection services in a 1 RU platform. Conventional solutions offer a single protection service solution in a card which then requires a shelf ranging in sizes from 2RU to 11RU. This not only requires additional space and power but also subtracts revenue generating slots from the service providers' implementation. Current 1+1 protection of critical 100G Router-to-Router traffic requires additional dedicated 100G transponders at each interface in the Network Cloud; while effective this is economically inefficient. 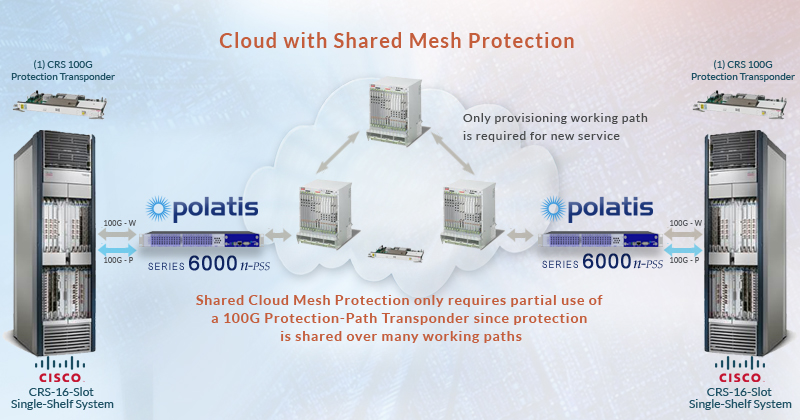 The combination of Polatis 6000n-PSS edge protection with cloud mesh protection greatly reduces the number of 100G protection transponders needed in cloud. This architecture will protect against client-side transponder failures as well as fiber cuts in the client-to-cloud connection path. Savings will not only be realized through the reduction of capital expenditures (i.e. less transponders) but also operational expenditures (lower power consumption). Recovering from a subsea fiber cut or failed transponder can cripple telecommunications services, so high-performance testing and restoral is essential. Monitoring performance and implementing high-performance protection in the event of an outage allows telecommunications carriers to swiftly restore service. With the Polatis Undersea Automatic Protection Switching solution, detection of an optical fault on one side will signal the fault via a telemetry channel to a switch on the other side, which will implement protection switching of the fibers to predefined protection fibers to swiftly restore service.